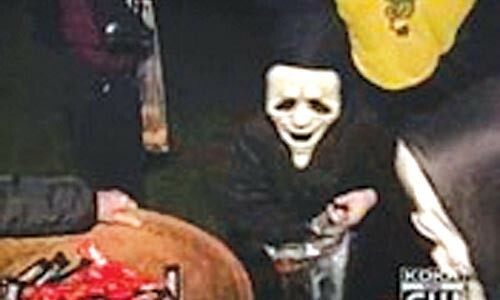 Summary: Nighttime trick-or-treating is reinstated in Oil City. 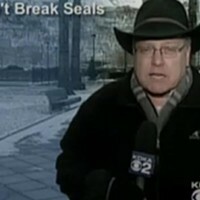 Reporter: Ralph Iannotti, KDKA Channel 2 Airtime: 2 minutes, 11 seconds on Oct. 31 Visuals: * Kids crunching in the leaves, dressed in assorted costumes, most of which don't seem to change much from year to year, trudging along with their big bags for candy-procurement. Highlights: * When anchor Ken Rice leads in: "Well, trick-or-treating at night is the holiday tradition in most places, but in Oil City, tragedy changed that tradition. Now though, after 16 years and a young girl's plea, kids once again collected candy under the cover of darkness." * When Iannotti recollects, "The last time there was nighttime trick-or-treating here in Oil City, George Herbert Walker Bush was in the White House." * When Iannotti explains, "This small town about 90 miles north of Pittsburgh has been haunted by a vicious Halloween-related murder ... but now after nighttime trick-or-treating in the town was banned ever since the murder, trick-or-treating was back in style." * When Iannotti reports, "In October 1992, 11-year-old Shauna Howe was kidnapped off an Oil City Street on her way home from a pre-Halloween party. Her body was found later. And since that tragic incident, Halloween in Oil City has never been quite the same. Until now." * When a boy describes his costume: "I don't know who I am. I'm just a zombie dude." * When another boy explains his costume: "A zombie hobo. I live in the trash can across the street." * When an Oil City dad says, "I think it's a wonderful opportunity for the community to heal and move forward and kinda take back the night." * When Iannotti introduces us to the catalyst behind the change: "Eleven-year-old fifth-grader Elizabeth Roess helped persuade Oil City officials to bring back the nighttime trick-or-treating tradition. And she says most of her friends and classmates are behind her. * Roess: "[T]here was only about four of 'em in my class that thought it shouldn't be in the night for safety reasons." * When Iannotti concludes, "Oil City may have been traumatized by what happened here 16 years ago, but by the looks of things, it's getting back to normal now." What We Learned: It's easier to ban trick-or-treat than to band together so that kids can still have fun, safely. Unanswered Question: Seriously -- why did it take so long for officials to reverse the ban? News Value: 5. And Elizabeth, those four students who voted against nighttime trick-or-treat will grow up to be members of Pittsburgh City Council.